Many of you created your New Year’s Resolutions last week. And although we are less than 2 weeks into the new year, I suspect that many of you have already failed in keeping your resolution. This would not be surprising as a study I conducted showed that only 8% of people are always successful in achieving the desired results. 92% fail! If you’ve been reading my blog for a while, you’ll know that there is a better way. Instead of resolutions (where failure is an option), I suggest themes (a game to be played). 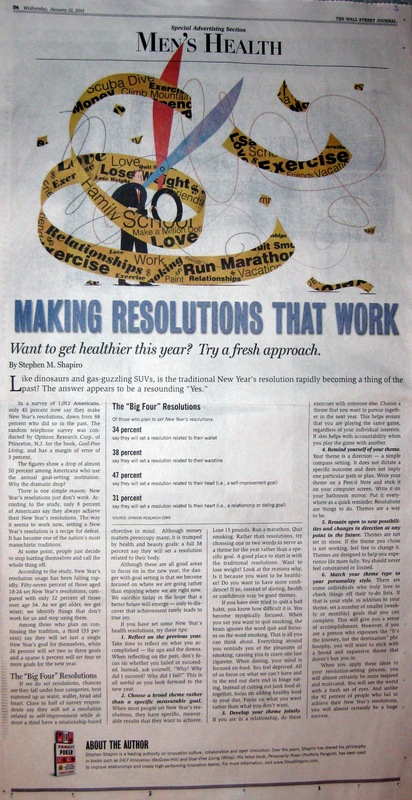 Here is an article a wrote a while ago, but it is timeless: Making Resolutions That Work. It remains one of my most often cited articles. Or, if you prefer, you can read the variant of this article that appeared as a full-page article in the Wall Street Journal several years ago (jpg). The general premise is that instead of setting resolutions that are specific goals (e.g., lose 10 pounds, stop smoking, exercise 3 times a week), you want to create themes that help guide you and your decision making throughout the year. These themes get you excited about the New Year and make activities that might have seemed tedious, more enjoyable. My theme for 2016 was Nothing New. No investments. No new content. Instead I found ways to leverage past investments and past relationships. Orlando – I moved to Orlando a year ago and recently bought I house. Last year I also got engaged to an amazing woman. Therefore, I would like to find ways of making more income that don’t involve getting on a plane. I want to enjoy my life here in Central Florida. I used to think that the way to do this was through “passive income” (e.g., products and other items that don’t require any time on my part). But I am seeing that it can also be accomplished through local events, bringing clients to me, and working remotely (email, phone calls, Skype, webinars and other virtual method). Investment – As I mentioned, last year was about avoiding investment. And it was great. I finished some projects I had started previously and found ways of using content I had created in the past. And of course I saved a few dollars in the process, while still maintaining the same level of income. This year however is about making investments, investments that will yield benefits in the future. These investments might require money, but not necessarily. For example, I will be writing a new book this year, which will require an investment of time. What are your themes for the new year? P.S. If you want to learn more about how to live a more powerful life, read Goal-Free Living To this day, I receive emails from people who read it 10 years ago and said it changed their lives. Posted in Goal-Free Living by Stephen Shapiro on Posted on January 9, 2017 , updated on January 8, 2017 by Stephen Shapiro.